Origin and Habitat: Known only from a few populations in the coastal northeastern parts of the Eastern Cape (in the former Transkei ) and in the coastal and Midland areas of KwaZulu-Natal. Habitat and ecology: It grows in moist, shaded conditions with the bulb partly exposed above dense pads of forest humus often within bush clumps or between moist rocky stream banks and on cliff ledges. As it is an evergreen plant, it likes moisture throughout the year, especially in summer, but less during the winter months. 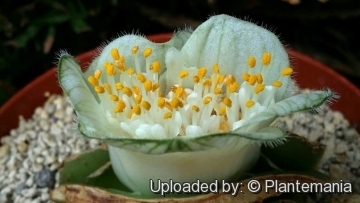 The flowers of Haemanthus deformis are probably pollinated by honey bees. 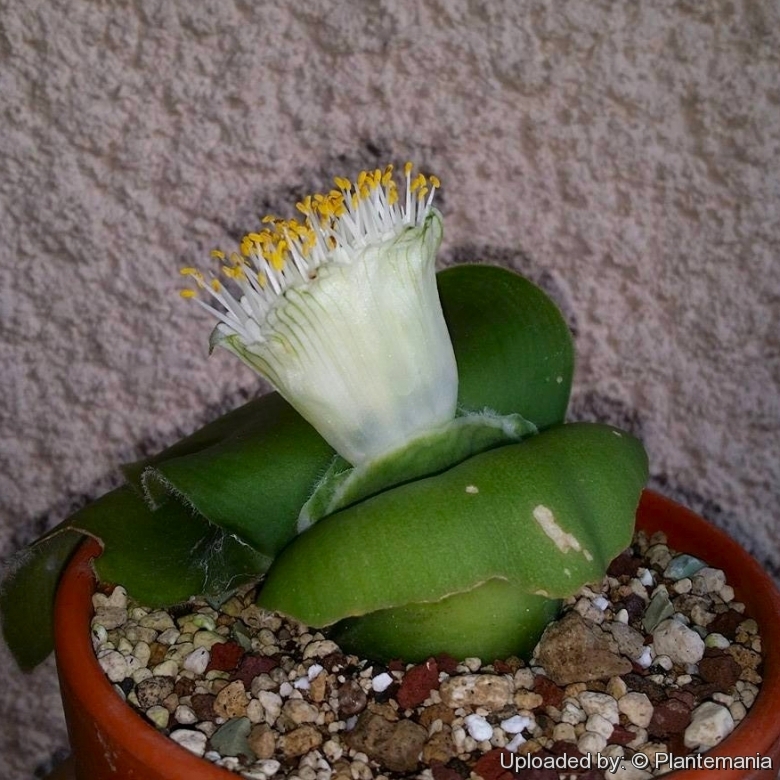 In habitat it can withstand temperatures down to -12º C.
Description: Haemanthus deformis is a lovely much shorter evergreen bulbous plant similar to Haemanthus albiflos and was introduced to cultivation in 1869. 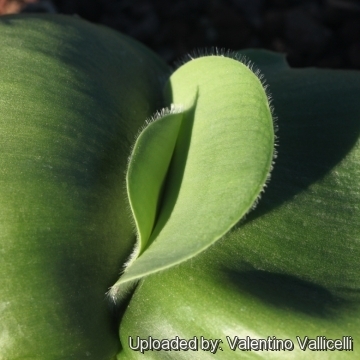 The short broad, succulent leaves spreading or lying flat on the ground and the dense brush of white flowers borne atop a short hairy stalk make Haemanthus deformis one of South Africa's most strange bulbous plants. The mature plant reaches only 8-12 cm high in flower. The name "deformis" simply refers to the unusual occurrence of leaves and flowers together. Bulb: Lightly compressed, 7-10 cm in diameter; tunics thick, green, bifarious. Unlike Haemanthus albiflos and Haemanthus pauculifolius, this species seems to grow with its bulbs below the surface of the ground with the neck just at ground level or only partially exposed. The even bulb tunics characteristically turning green when exposed to light. In time it slowly forms clumps of up to about 10 mature bulbs. Leaves: 2 (or 4) distichous, contemporary with the flowers, firm, leathery, fleshy, strongly arched, spreading or lie flat on the ground, oblong to almost square 7-28 cm in length, and up to 7-25 cm broad, dull bluish-green, grey or greenish grey and unspotted; margins more or less ciliated. 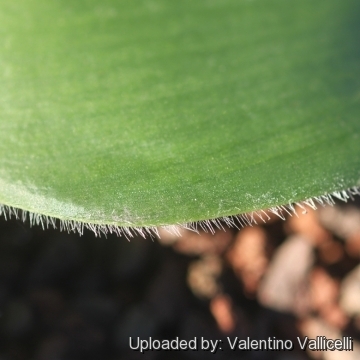 The amount of hair on the leaves varies from none to densely hairy. The plants are evergreen, producing a set of two new leaves straight after the flower head appears or just after bloom. The old set of leaves then withers and dies over a period of several months. Each leaf pair persists for more than a year. Infloerscence: It produces a solitary dense, flattened umbel (flower head) of many slender individual flowers on a very short scape 1-6 cm tall, thick, which is bent, more or less hairy, centred in the crease between the two previous season’s leaves, not from a lateral point as in the other evergreen Haemanthus species. Umbel compressed up to 4 cm in diameter. Flowers: Small, erect, cupped by broad, petal-like, white bracts. Stamens: Longer than the perianth-segments with bright yellow pollen on prominent white filaments. Stiles: White, protruding about as long as the stamens. Perianth tube: 7,5-9 mm, lobes 2-2,5 cm. Spates: The flowers are enclosed by 5 or 7 overlapping, broad, strong white, petal-like, spates (bracts) that are subequal, ascending, obovate-oblong, obtuse, distinctly recurved in the upper part about and about 3-6 cm long by 1,2-4,5 cm wide. Blooming season: The flowers bloom mainly in late autumn but may appear at any time until late spring. Fruit: If pollinated, it produces clusters of rounded fleshy dark orange red berries containing a few seeds that emit a strong, musty smell. The ripe berries drop to the ground where the pulpy layer disintegrates releasing the seeds. Seeds: Hard and oblong. The seeds germinate almost immediately after maturation. Water: As it is an evergreen plant, it likes moisture throughout the year, especially in summer, but less during the winter months. Exposure:It is most suitably grown in semi-shaded but it will even grow and bloom in heavy shade. Watering: Water the plants heavily once per week during the summer growing period, but reduce watering in winter to once every two weeks, although they do survive heavy winter rainfall in mild parts of the Western Cape. Garden uses: In warm and temperate climates grow it shady courtyard gardens, in raised beds, shaded rockeries. In countries with cold winter climates, they are best grown in containers in a cool or slightly heated greenhouse. When grown in the garden, Haemanthus deformis makes an excellent companion subject to other shade-loving plants. 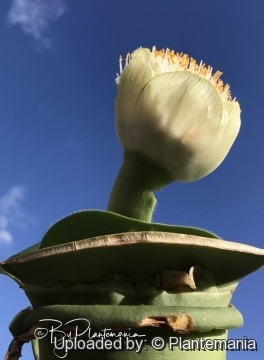 Traditional uses: Haemanthus deformis is not known to be used for medicinal or magical purposes. 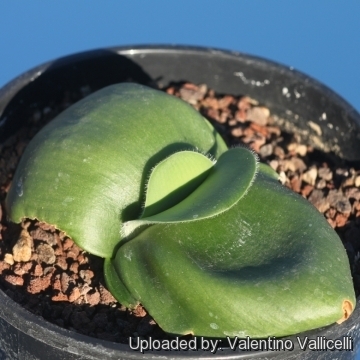 The plants are mostly grown by specialist bulb collectors, usually as container subjects. 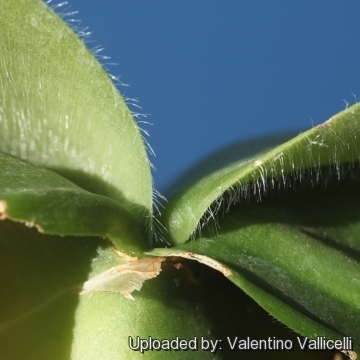 Pest and diseases: The bulbs and leaf bases of Haemanthus deformis are susceptible to attack by mealy bugs, and the leaf margins are chewed by snout beetles and slugs at night. 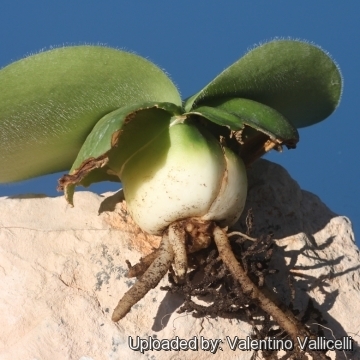 Propagation: By offsets or from seed. 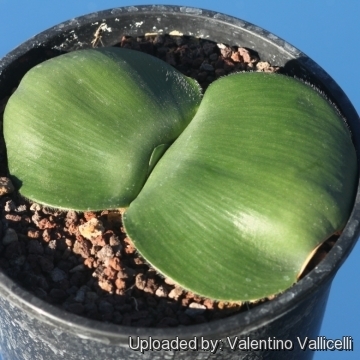 Offsets are rather slow to form, and are best separated from the mother bulb straight after flowering, just as the new leaves begin to develop. Seeds form readily and should be harvested and sown as soon as they can be easily removed from the bright orange, fleshy berries. Seeds may take up to two months before the first leaf appears above ground, and a further four to five years to flower for the first time.